Christina Hibbard is an abstract mixed-media artist, who recently turned her passions of painting and collage-making into a full-time gig after fifteen years of working toward eliminating violence against women and girls, teaching and coaching women. 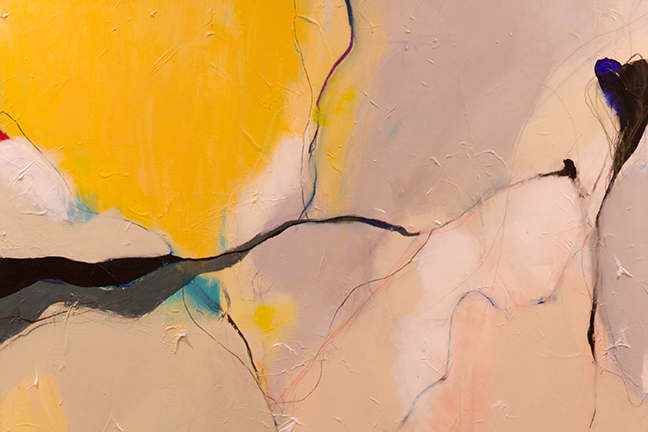 Christina approaches most of her paintings intuitively, meaning without an end goal in mind. She begins a painting by layering her canvas or paper with acrylic paints, collage (papers, acrylic skins), inks, charcoal, colored pencils and crayon (watercolor, oil pastel, wax). She does this until she sees something she likes (usually a color or line), then adds more of it. Over time the painting is slowly revealed. Christina enjoys the juxtaposition of neatness (in color or line) with the more quietly messy areas. She wants to the viewer to catch tiny glimpses at the layers underneath, and wonder about the painting that was there before. 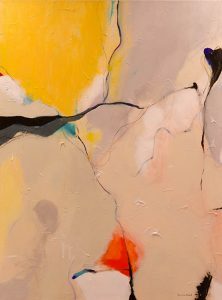 Christina has exhibited in many Northern Virginia galleries, most recently at the Art League in Alexandria, Virginia where she was awarded an Honorable Mention. She is a member of the Art League, Falls Church Arts, McLean Arts Society, Maryland Federation of the Arts, Del Ray Artisans, and McLean Project for the Arts.